Details below of a small Quarry Tiled floor we deep cleaned which included a lobby and adjacent toilet. The property was located in Hitchin which is a market town in North Hertfordshire it is notable for St. Mary’s Church, which is remarkably large for a town of its size. The tiles were in good physical condition, but were looking a little tired, they just needed a good clean and seal. Also, if you look closely at the photographs you will see the grout was stained with the remains of some red paint which needed to be removed. They had tried some household solutions but had not managed to remove the marks and the floor had lost its’ sheen. We discussed the process, agreed a price and I arranged a date to return and carry out the work. On our return our first task was to prepare the areas with protective tape to threshold edges surrounding the floor, adjacent doors and anywhere that we didn’t want our solutions to touch. 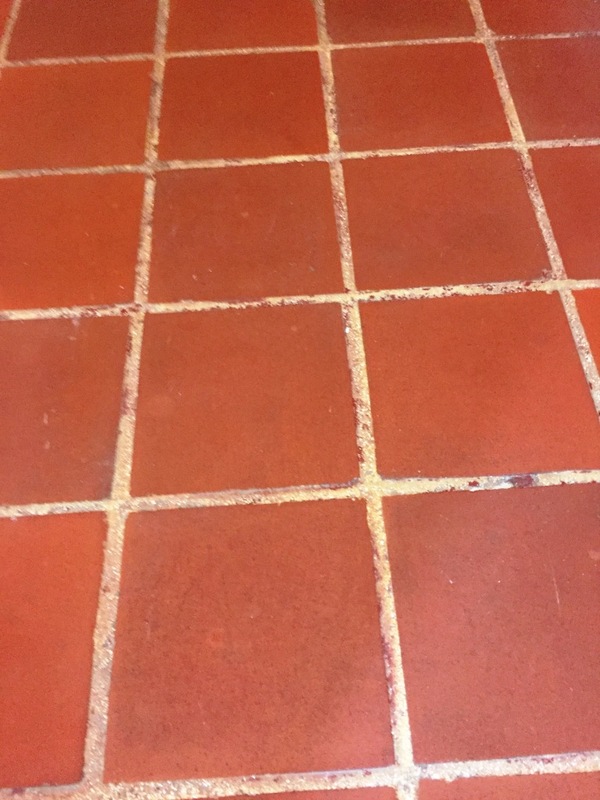 The paint stains were spot treated using a strong dilution of Tile Doctor Remove and Go which was scrubbed into the grout by hand. This is a multi-purpose stripper made with a long dwell-time to remove most coatings and sealers, but particularly good on paints. It is also the perfect product to draw out ingrained stains and remove any heavy grease build-up. 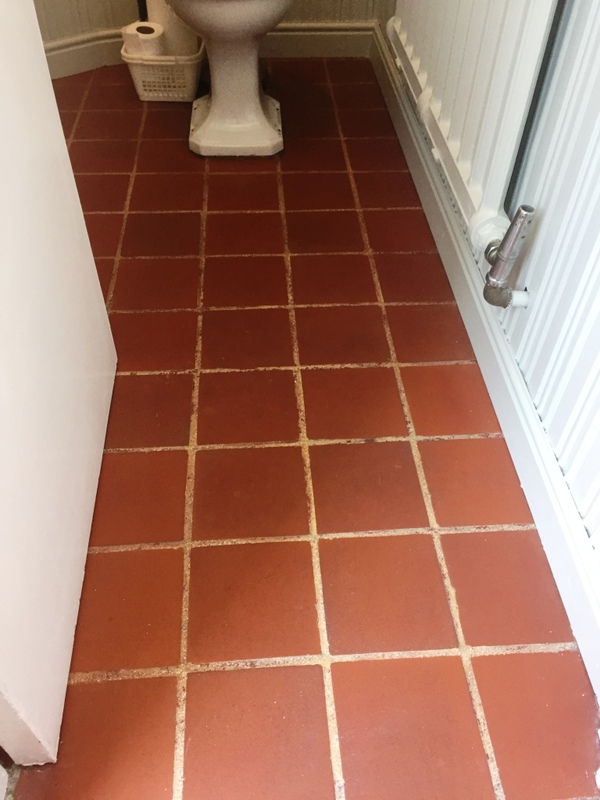 Then the tiles and grout were cleaned using Tile Doctor Pro-Clean, this one is a concentrated, multi-purpose high-alkaline cleaner, stripper and degreaser. Dependent on the needs of the tiles we dilute it to suit. We usually dilute with 3 to 5 parts water to use as a very effective cleaner that removes grease, from areas that have been neglected or subjected to heavy use. Alternatively, and as in this situation, we diluted with 2 parts water to strip the synthetic and acrylic waxes that had built up on the floor over the years. 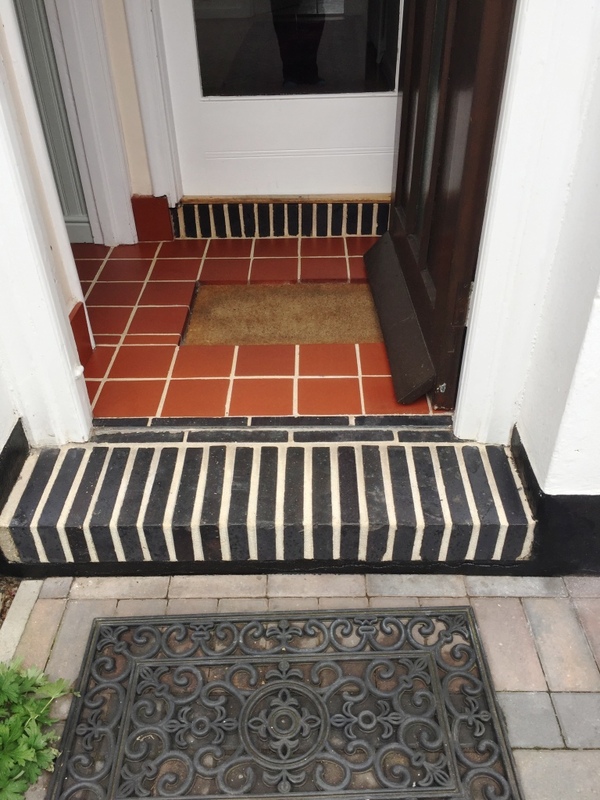 The entrance and porch were then wet vacuumed, and the water rinsed, then allowed to dry off overnight ahead of the sealing process the following day. On returning to the property the following day, I used a moisture meter to ensure the floor was completely dry and ready for the next stage. 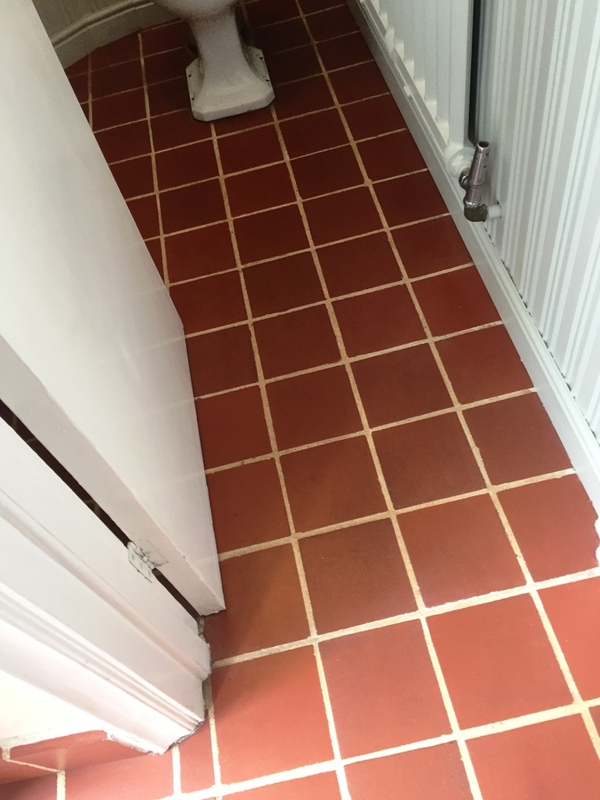 Once satisfied I started to apply a single coat of Tile Doctor Colour Grow this is an impregnating sealer which is applied to protect the tiles and offers a durable surface whilst enhancing their natural colour. Finally, to complete, this was followed by three coats of Seal and Go to add a lasting protective seal and a low sheen durable finish. The client was very happy with the completed floor, it had brightened up the whole area, particularly the downstairs cloakroom. She was also pleased it was now going to be easier to maintain and keep clean and she had finally got rid of the offending red paint! 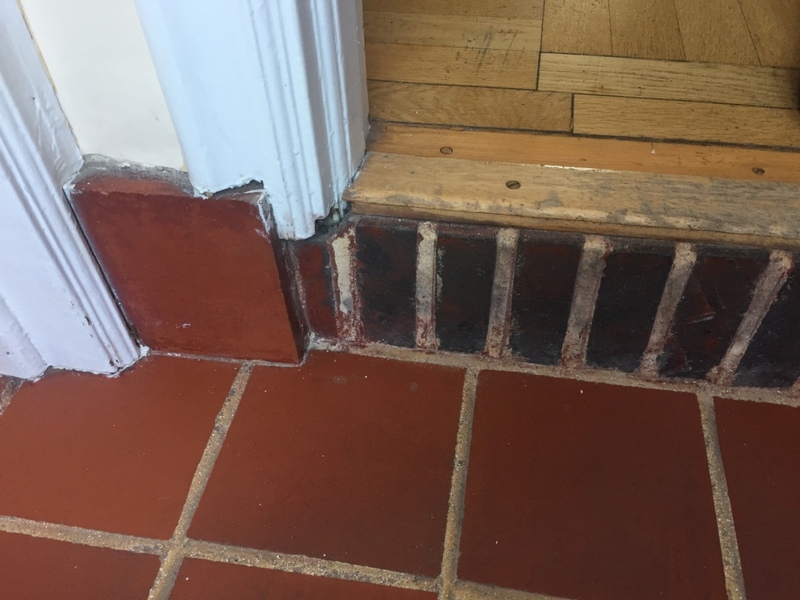 This entry was posted in Work History and tagged entrance hall, hertfordshire, Hitchin, paint staining, quarry tile restoration, Quarry Tile Sealing, Quarry Tiles Floor, tile cleaning by AbzDominise. Bookmark the permalink. Covering Hertfordshire, Rob Voyce is an agent of Tile Doctor, the largest Tile, Stone and Grout restorative cleaning network in the UK who have developed the products and techniques to handle a multitude of issues surrounding tile, stone and grout restoration.